Just back from a very enjoyable 24 hours at St Pancras, Lewes, courtesy of the amazing Fr Biggerstaff. His presbytery is in a wonderful location, with large Victorian rooms, wooden floor boards, no smothering central heating and a plethora of clerical nic-nacs (the usual stuff - books, reliquaries, antique prints, ecclesiastical headwear, et al). 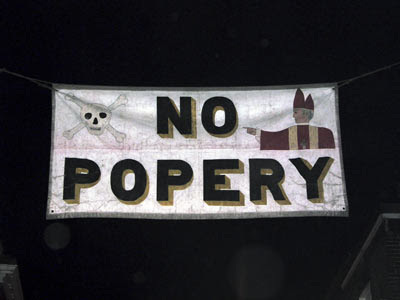 The 'Know Popery Lecture' on English Cardinals attracted an audience of around 60, including a few non-Catholics. The parish priest hopes to make this an annual event, with a focus on English Church History and always around Bonfire Night. Next year's installment will probably look at the Gunpowder Plot itself! Very glad to hear you have returned from Lewes unscathed, and that the mobs didn't burn down Father Richard Biggerstaffe's presbytery with its very interesting contents. And the photos posted on some blogs looked rather intimidating, but I daresay you've already seen them. One or two commenters in the comboxes seem to think the present day revels are less to do with the "Lewes martyrs" and anti-Catholic sentiment, and more to do with modern raucous behaviour and quasi pagan celebration. I hope the Know Popery Lecture went well. Where are the Guardian-reading-do-gooders up in arms, when stuff like this happens? I am glad it went well. It remains incredible that the Pope can be burned in effigy, reflecting latent anti Catholicism as Englands dirty little secret. Its to the immense credit of Norman Baker the local Liberal MP that he does not attend the ceremonies. In fairness neither did his predecessor Tim Rathbone, the wonderfully anti Thatcher Tory. Baker has gone one step further by publicising the shame of Lewes..a genuinely selfless act, rare in any party.